*I received a copy of the NKJV Study Bible in exchange for my honest review. This post contains affiliate links. Growing up, my Bible was an old paperback Bible that my grandmother gifted me. It wasn’t anything fancy and, in fact, the paperbacking came apart – leaving the pages loose, but I loved that Bible. To me, that Bible had something money could never buy, it had sentimental value. I long to find a Bible for my children that holds the same sentimental value for them, so when I heard about the NKJV Study Bible for Kids, I thought it would be a great Bible to gift my oldest son, in hopes that one day this may be the Bible he thinks of in his childhood. The New King James Version Study Bible for Kids is a hit for children ages 8-12. With it’s full-colored pages and vibrant colors, studying His word has never been easier or more fun. 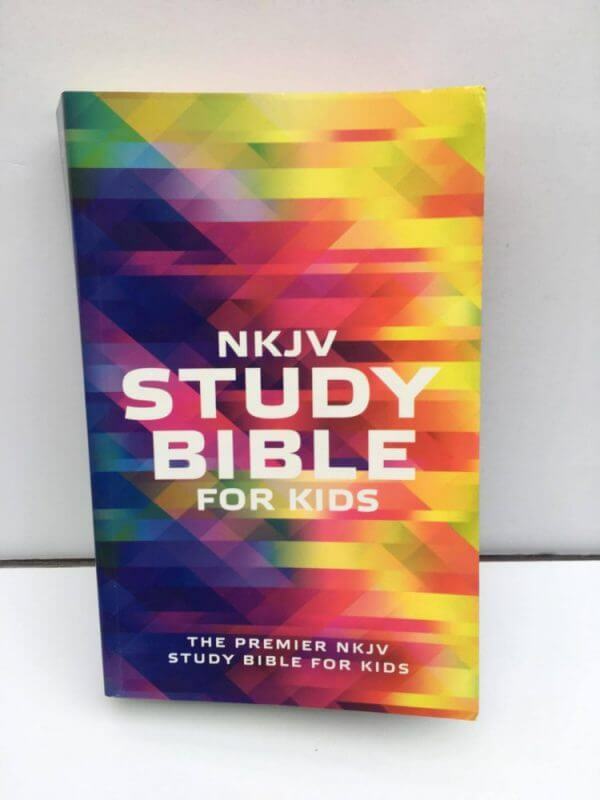 Created with your child in mind, this Bible features the trustworthy NKJV translation and is packed full of more than 800 study notes to help your child engage and understand the words of the Bible. This Bible features many important things like; book introductions, personality profiles, word definitions, maps, charts, a concordance, a Bible dictionary, and a topical index to help kids learn more about God’s word. It’s not often I even look at a paperbacked Bible, anymore, but something about the NKJV Study Bible for Kids caught my eye. 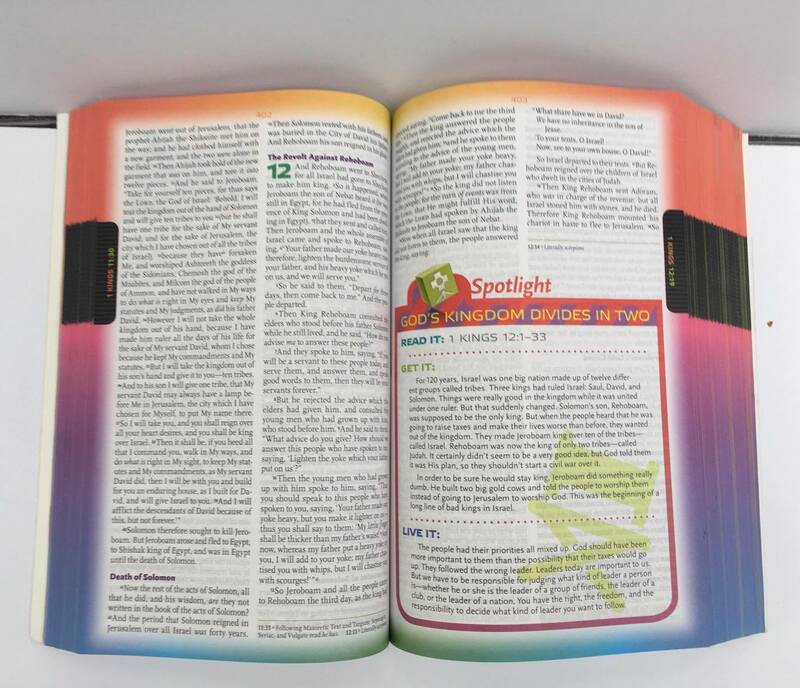 From first look, the colors of this Bible are sure to draw you in, but then once you pick it up the full-colored pages really grab your attention. In fact, I don’t remember ever seeing a Bible that was as colorful as this one and, to say the least, I really liked it. So often, we refer to Bibles as these really big, boring, set of rule, but we don’t see a Bible for what it really is – a book of fun stories and our guide to happiness. The NKJV Study Bible for Kids has so many things I love about it, but my favorite things about it is it’s Spotlight feature. Each Spotlight teaches kids a story in the Bible and then connects it to every day life. While I know other Bibles may have something similar, my son found the Spotlights really interesting. While this Bible uses the trusted, NKJV Version, many of the extra features talk to the kids in a down-to-earth one on one tone, which is a lot easier for them to relate to. There are so many things I love about this Bible, but if I had to change one thing, it would definitely be the paperback version – I am just not a fan of paperback. Other than that, the NKJV Study Bible for Kids is one I would really recommend, my son loves it, I love it, and, most of all, I know God loves Him reading it! If you would like to check this Bible out for the holidays or for now, I encourage you to by clicking on this LINK. To read more Bible Reviews check out this PAGE.